This is another card we made during the technique class using the "Bleach Out" technique. 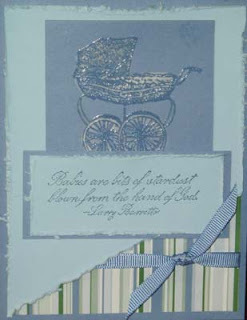 It also would look great with the Stork image from the retired Buggies & Booties stamp set. Use a stamp that has several fine lines, such as Buggies and Booties (retired), Symbols of Salvation (retired), Bloomin’ Beautiful (new Occasions Mini 2008 catalog), From the Garden (Hostess Set), Thoughts of Father, Pretty Peony, Fruit Stand, Lovely as a Tree, Morning Soft, Noble Deer, Wildlife Reserve, Spring Song, Winds of Grace, Seaside, Touch of Nature. Use light color cardstock (not designer series paper). It does work on dark color cardstock but not as well. On desired cardstock, use the Embossing Buddy where you want to stamp your image. Using the Versa Mark pad, stamp your image (stamp) in it, and then on the desired cardstock. Cover in Clear Embossing Powder. Use paintbrush and dip in bleach. In the stamped image, cover the areas which you would like “bleached out”. Start with a small amount of water first, you can always go over it again and again to add more “bleaching out”. Complete the rest of your card as desired.